Learn How To Play Drums with Drum Lessons! This website is a resource for people who are curious about the world of drumming. 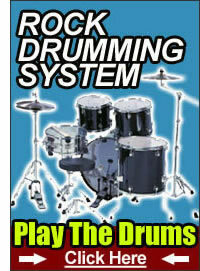 It is created primarily for beginners, but also has a great deal of information for intermediate and advanced drummers. Our resources include detailed drum lessons, informative drum articles, and links to other valuable drumming websites. Our team of passionate drummers are here to help you develop and expand your knowledge of the drums. If you seek knowledge, if you seek musical growth, if you seek information that is presented in a simple format... you will be right at home here on DrummerLessons.com! You can check out the online drum lessons on FDL to get started now, or visit the Rock Drumming System website for more information about their detailed DVD-based training package. Both are great options for new drummers.